Observe a herd of elephants in their natural surroundings and you will be mesmerized by their calm magnificence, their almost human relationship with one another. Majestic and truly the kings of the jungle, they are a force to be reckoned with. See an elephant only 20 feet away and you will never want to see one in a circus or traditional zoo. They move with a certainty and grace that is not seen in captivity. Tania James has brought this perspective to life. 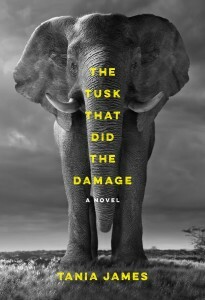 The Tusk That Did the Damage is an amazing story of love and betrayal told through the voices of three narrators. The elephant tells his story of how his mother was killed and he was captured. His name initially was “a sound only his kin could make in the hollows of their throats.” He became known as Sooryamangalam Sreeganeshan, the most famous temple elephant. His picture was on postcards and calendars, and he carried grooms to their weddings. Years later, he became known as the Gravedigger after he had escaped to the wild. He killed villagers and covered them with brush as if they were buried, a detail based on a real elephant in Assam. The second perspective of The Tusk That Did the Damage is that of Jayan, the poacher, as told by Manu Shivaram, his brother. Their cousin Raghu was killed one night by an elephant and Manu, who should have been with him that night, had stayed home, pleading fatigue. Manu is the good brother who does not wish to be a poacher, but is drawn into a desperate web created by his brother. The village is poor and its inhabitants are further impoverished by laws that prevent them from harvesting trees or firewood from the adjacent national park. All the while, they are subject to raids from hungry elephants. Emma Lewis voices the final viewpoint as she details her efforts with Teddy Welsh to create a documentary on elephant poaching. In order to get the story they must ambush some of their subjects and get them to admit to certain facts they would prefer to be unknown. Teddy and Emma will do almost anything to get their story and establish themselves as serious filmmakers. Of course, there is an element of sexual tension between them and between Emma and Dr. Ravi Varma, a veterinarian who may be on the side of the elephants, the villagers, or the national parks administration. In her second acclaimed novel Tania James has brought one elephant to life in a most unconventional way and recreated a believable world of village life in Southern India. At the same time, she has explored the ethical and moral consequences implicit in the ivory trade and its effects on elephants and the villagers who live where elephants roam. Who is responsible for the violence between humans and elephants? What causes a rogue elephant? What are the effects of the intersections among elephants, villagers, park rangers, and commercial interests? Heavily researched and accurate in so many aspects, The Tusk That Did the Damage never seems to be a jeremiad toward any faction, and remains an engrossing and entertaining novel. Both sad and heartwarming, it provides an elegant, appropriate, and unexpected ending as James examines the complicated relationships of humans, humans and animals, and animals.